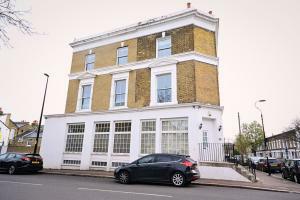 Gorgeous two bedroom maisonette in a former pub conversion in prime conservation area location. Spanning over two floors it offers an exceptionally spacious and versatile living space with open plan kitchen on the upper floor and two excellent bedrooms and large bathroom on the lower floor. You can also enjoy a sunny outside patio garden that's great for lazy summer weekends and easy to maintain. Storage galore, double glazed windows and central heating complete an already pretty perfect package. Shops and transport are within a short walking distance making it perfect for commuters to Central London.